Author/Opus: This is the 36th puzzle from our contributing puzzlemaster Carl Worth. Rules: Combination of Spiral Galaxies and Fillomino rules. Divide the grid along the dotted lines into regions, each of which must contain either exactly one circle, or one or more identical given numbers. 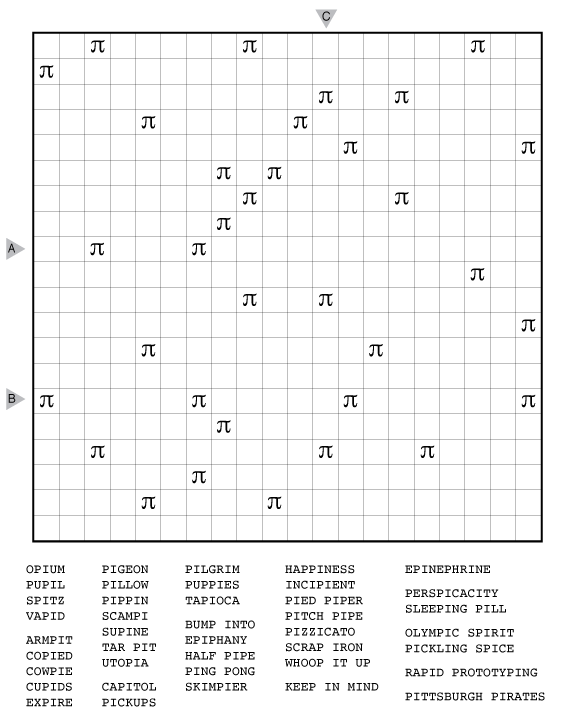 (Note that there are no “hidden polyominoes” in this puzzle meaning there are no regions without a given number or a given circle.) Each region containing a circle is a “galaxy” and must have rotational symmetry with the circle at its center. Each region with given numbers must be the same size in cells as those numbers. Two regions with numbers of the same size cannot share an edge, but a region with numbers and a region with a circle in it can be the same size. Answer String: For each cell in the marked rows, enter the area of the region it belongs to. Enter just the last digit for any two-digit number. Start with the 4th row, followed by a comma, followed by the 8th row. Note: Follow this link for classic Spiral Galaxies puzzles on this website and this link for variations on Spiral Galaxies puzzles. If you are new to this puzzle type, here are our easiest Spiral Galaxies Puzzles to get started on. More Spiral Galaxies puzzles will eventually be found in The Art of Puzzles 2. Author/Opus: This is the 35th puzzle from our contributing puzzlemaster Carl Worth. Rules: Combination of Battleships and Star Battle. Follow standard Battleships rules. Also, exactly two ship segments are present in each bold region. Answer String: For each row from top to bottom, enter the number of the first column from the left where a ship segment appears (enter just the last digit for any two-digit number). If the row is empty, enter 0. Enter these numbers as a single string with no separators. Note: Follow this link for classic Star Battles and this link for classic Battleships. More Battleships puzzles can be found in Battleships and Variations, in The Art of Puzzles, and in our beginner-friendly collection Intro to GMPuzzles by Serkan Yürekli. Author/Opus: This is the 34th puzzle from our contributing puzzlemaster Carl Worth. 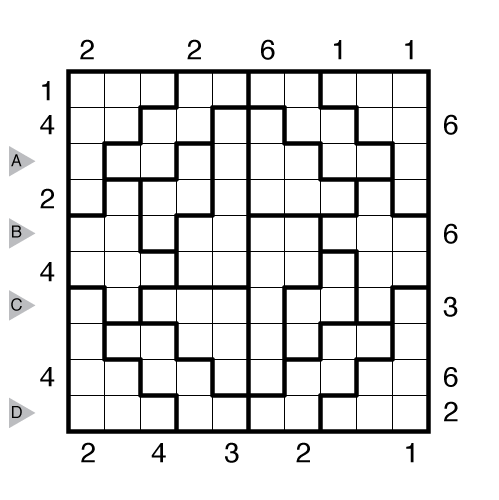 Rules: In this variation of Nanro, numbers are now given outside the grid. 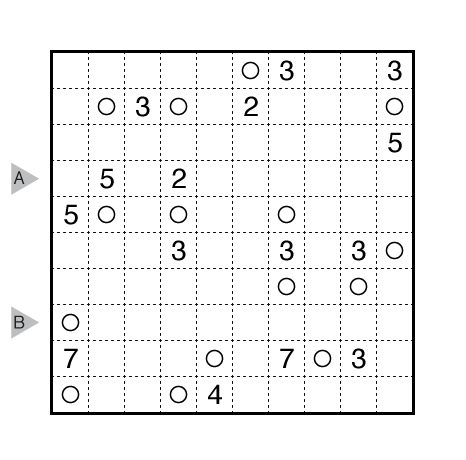 Each number clue represents the first number placed inside the grid in that row or column in the corresponding direction. Author/Opus: This is the 33rd puzzle from our contributing puzzlemaster Carl Worth. 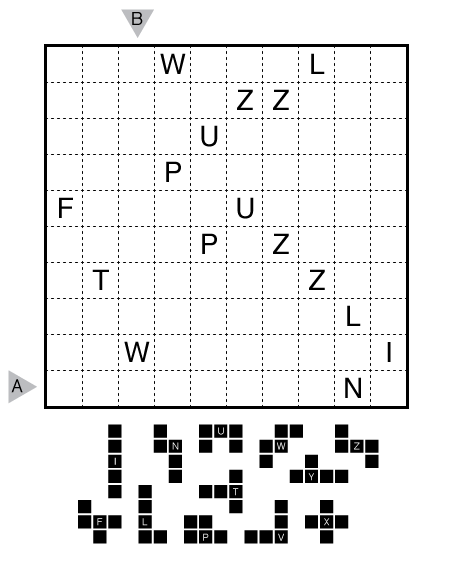 Answer String: Enter the letter associated with the pentomino occupying each cell in the marked rows from left to right and in the marked columns from top to bottom, separating the groups with a comma. Use CAPITAL LETTERS! Note: Follow this link for other Pentominous puzzles. If you are new to this puzzle type, here are our easiest Pentominous to get started on. More Pentominous puzzles can be found in Plenty o’ Pentominous by Grant Fikes and Murat Can Tonta. Author/Opus: This is the 32nd puzzle from our contributing puzzlemaster Carl Worth. Author/Opus: This is the 31st puzzle from our contributing puzzlemaster Carl Worth. 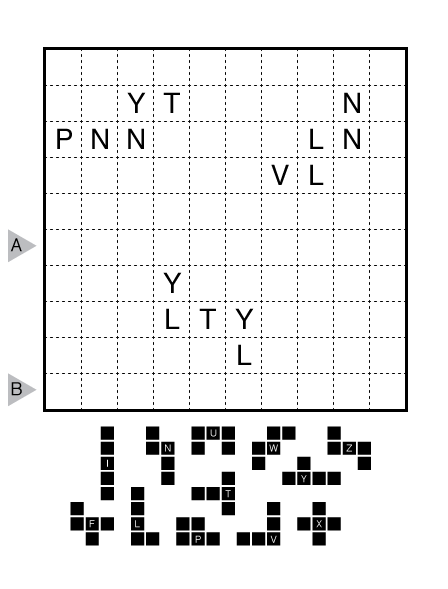 Rules: Place each of the given words into the grid, one letter per cell, reading from left to right or top to bottom. 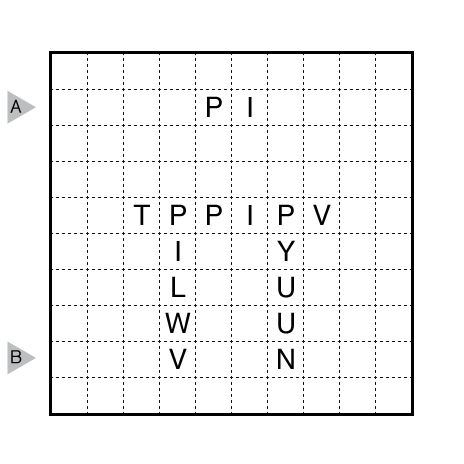 All words must be connected, and no words other than the given words can appear in the grid. All occurrences of PI have already been entered into the grid (as the symbol π). Answer String: Enter all crisscross letters (and spelling out PI where it is used) from left to right for the marked rows and top to bottom for the marked columns. Separate each row/column’s entry with a comma. Use CAPITAL LETTERS and ignore all empty cells. Note: Follow this link for other word logic puzzles. 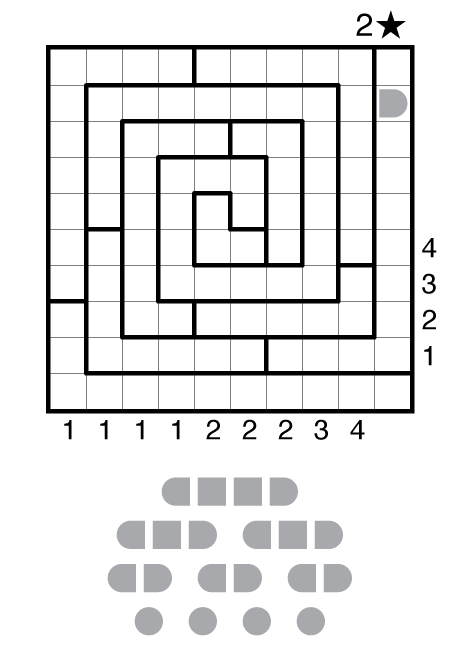 Author/Opus: This is the 30th puzzle from our contributing puzzlemaster Carl Worth. Note: Follow this link for other Pentominous puzzles. If you are new to this puzzle type, here are our easiest Pentominous to get started on.